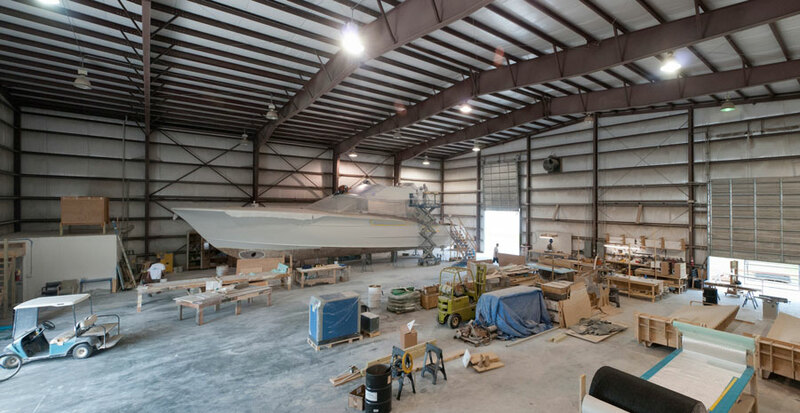 Sited on 45 acres of deep water frontage at ICW mile marker 198, Jarrett Bay Boatworks is the anchor occupant of a 175-acre marine industrial park boasting over 20 other marine service providers and suppliers. There are few facilities that offer such a variety of boating services in a comparable location. Our core service facility offers nearly ¼ mile of floating dock space on the ICW and 600 feet of slip space in a generous basin. Four travel lifts are operational capable of hauling out vessels up to 300-ton/135 ft. Land-based amenities include multiple indoor repair facilities, a climate-controlled paint booth, high bay outfitting, and our new construction facility; all-told a building footprint stretching over 137,000 square feet. Also home to our transient slips, Ship’s Store, East’ard Marine Supply, Surplus & Salvage, and a plethora of marine fabrication services, our labor rates are competitive and we have one of the lowest staff turnover rates in the industry. The Jarrett Bay Marine Park businesses include parts and service providers for all the major marine engine brands and associated equipment such as Caterpillar, MTU, MAN, Cummins, Volvo, Yamaha and Mercury engines and ZF transmissions. Top tower builders are accessible on-site, as well as companies that specialize in marine electronics, interior design and yacht sales and brokerage. In, short, if you need it, you can most likely get it at Jarrett Bay Boatworks.